To continue the work of the Summit, we are proud to partner with a custom designed social network site provided by uBegin.com. You can see below what our project page looks like within the platform. To connect and share with us in uBegin, enter your email below. 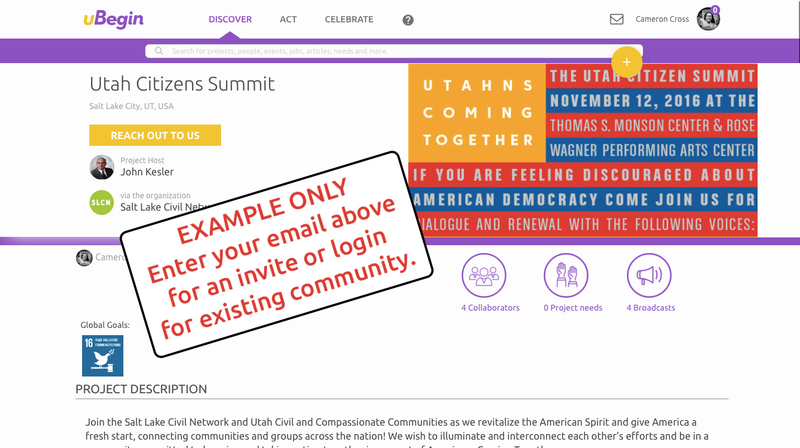 You’ll be sent an email inviting you to join the Utah Citizen Summit project. Creating a profile as a Collaborator on uBegin is free. This platform enables us to share stories about what individuals, groups and communities are doing to help Americans come together and to network with others who are interested in this work. We become a part of rich online resource for mutual edification, networking, and co-learning with collaborative project spaces and communication options. You will also be able to share a summary of your conversation at the Summit or from LivingRoom conversations and connect with others to continue these discussions. Project spaces for local initiatives can also be provided for those who are interested in promoting your own related local projects and broadcasting requests for resources.